It is absolutely true that, nowadays, technology has been an integral part of our daily lives. People all around the globe rely on gadgets for innumerable necessary reasons, such as communication, research, employment, etc. As the world is developing, more gadgets are getting introduced, and more dependent people have become on them. On one side technology has a remarkable positive role in our life, but on the other side it has negative impacts as well. Though technology has brought a lot of ease and advancement to humankind, the student section of the society has been adversely affected due to it. The young population that is in its growing age gets easily manipulated with the advanced trending gadgets. Our dissertation team has enlisted a few consequences that affect the lives of students due to excessive use of electronic devices. Children naturally replicate what they see. Hence, exposure to violence on television, movies, and recent video games increases the risk of violent behaviour in teenagers. Also, with the increasing use of mobile phones, text messages, e-mails, and chat rooms, these little youths have created new means of social interaction in which aggression can occur abruptly and innocent kids might get victim of their own mind. Small kids avoid physical activities once they have any gadget in their hands. Therefore, playing with electronic gadgets and eating a lot of fast food without doing any physical activity, adds many pounds of weight. Children don’t realise this in the beginning but suffer throughout their life due to the same. This is one of the major reasons why children should not have access to electronic gadgets until they reach a certain age. Besides, the blue light emitted by the super-sharp display prevents the release of melatonin, an important sleep hormone. This, in turn, can lead to sleep impairments in children. Electronic devices, such as mobile phones and computers are the main causes of eye problems in children. The fluid present in eyes starts drying due to the overuse of these gadgets. Constant strain might also lead to this situation. This, in turn, causes multiple eye infections and affects the vision as well. According to our dissertation help experts, if a sound up to 85 decibels is heard on a daily basis, then it damages the microscopic hair of the inner ears and converts it into scar tissue. Children love loud music and high volume of electronic devices. And, this is one of major means that gadgets affect their health. Ionizing radiation of the electronic gadgets is a cancer causing agent. This radiation leads to several types of cancer, such as leukemia, skin, thyroid, breast and stomach cancer. In 2013, Daily mail reported that 29% of the toddlers can easily use the gadgets and remaining 70% are master by primary school age. Really Surprising! According to the USA Centers for Disease Control and Prevention, an average child spends about 8 hours a day watching electronic screens. As they are growing older the use of gadgets also increases. Too much gadget use can also affect the long-term vision problem. 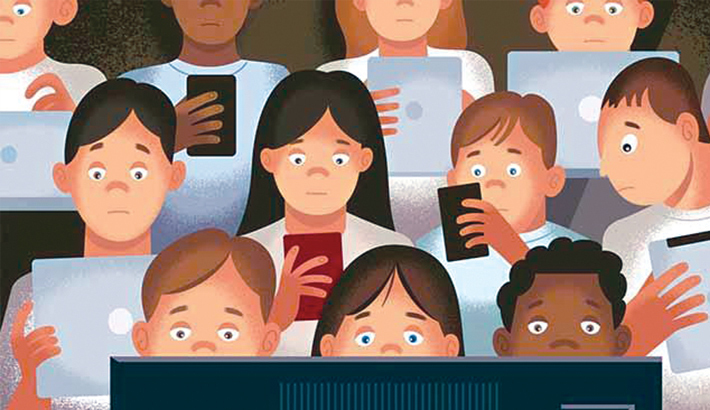 Plus chance of myopia also increases in children when they spend about 8 hours daily on gadgets. When people use electronic screens, they blink less. On an average, a person blinks about 15 times in a minute. Due to the high attention required while using an electronic screen, this rate can drop to less than 5 times in a minute. A lot of research has been done on this type of phenomena. Motor skills are the skills which are linked with muscles of small movements like lips, fingers, wrists, tongue and toes. So when toddlers play games on tablet or any other gadgets their fingers and hands get a workout. This is such a healthy exercise for growing children. Using modern keyboards and keypads or other handheld devices they have no risk of any injury or any kind of threat as compared to playing outside. Cognitive skills are the ability to process information, reasoning, remembering and relating objects with other objects. These skills are directly related to memory, and language. Technology helps faster and better development of cognitive skills in kids. The games which they use to play before whether it’s a puzzle or scribbling on drawing books everything now can be done on electronic devices. Like interactive apps, video games, different kinds of challenges and educative programmes available on various kinds of devices. Such products would always improve a kid’s cognitive skills. The modern gadgets help to develop their learning skills faster as they are more interested in gadgets then books. Gadgets occupy kid’s minds. Leave a child with a Smartphone, tablet Xbox or any other handheld device he can spend hours or even weeks with it. So you don’t have to worry about the child because there is no risk of getting injured or harmed by these gadgets. Also don’t worry about any other major mess like painting a wall, disturbing others. Simply a Smartphone can keep a child busy for hours, whether he is playing games or watching videos etc. Gadgets are fun for kids while they use them. They enjoy playing games on them whether it’s a puzzle or race, or candy crush, or a simple first person shooter game, children have fun and they understand simple aspects of cause and effect, action and reaction. Electronic devices have much more advanced learning options for children in a fun way then books or older methods. Technology has been proven to be very helpful in educating student. Children can access the educational websites and can get detailed information about required topic. Technology makes things better as have access to pile of material and can be very useful in research and understanding things better. Visual presentations, educational videos, interactive programmes, learning tutorial and variety of books available all the time on internet has revolutionised education in a better way. Kids learn state of the art tools and methods by their own. Educational games help children to perform well in their studies. As they can have many online quizzes available, online tutorials and brainstorming riddles.Children love to play video games. When playing such games with other people around the world and their relatives, friends they get the feeling of competition that enhances their skills of competition and enables them to manage themselves in competing environment. In addition to depriving one of sleep and disrupting the body clock, addiction to smartphones and gadgets can rob one of much-needed private family time. It’s important to detach and minimize dependence on technology once in a while. Deactivate the mobile internet data feature on your phone on leaving work, says Dhruv Desai, group HR head at Angel Broking. Post-work discussions take place through email and Whatsapp. Deactivating internet on tablets and phones can help detach from ongoing messages and mails, he says. Most smartphones also have an option of switching between personal and office mode, and such features can help reduce dependency. It is important to be disciplined about allocating fixed time slots for other things. Inculcating the habit of switching off for some time is key,” says P Thiruvengadam, senior director, human capital at Deloitte. He cites the example of an IT major that expected all employees to switch off devices for two hours at work. Research has revealed that displays on most devices suppress melatonin, which disrupts body clocks.